Register your product and take advantage of the benefits! --- 01 02 03 04 05 06 07 08 09 10 11 12 13 14 15 16 17 18 19 20 21 22 23 24 25 26 27 28 29 30 31 . --- 01 02 03 04 05 06 07 08 09 10 11 12 . Fields marked with * are mandatory fields for product registration. With your consent, the other information provided will be used to enable CASIO to send you personalised product recommendations and interest-based advertising. 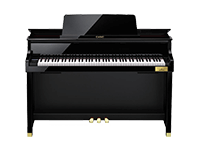 The product registration period lasts two years (Five years in the case of GP-500, GP-400, GP-300 and AP-700 digital pianos) from the date of purchase. If you register within this period, your product registration will automatically end upon expiry of this period. It is not possible to register a product outside of this period. If necessary, the receipt may need to be submitted as proof of the date of purchase. Entering information into the product registration database of Casio Europe GmbH and providing your personal data in relation to this is voluntary. If you would like to register, you must provide the mandatory information in order to complete the registration process. If you do not enter your personal data in the fields marked with *, we will not be able to contact you and provide you with safety-related information. If you do not provide us with the other personal data, we will not be able to send you any personalised product recommendations or interest-based advertising. Yes, I would like to take part in surveys regarding my CASIO product and I give my consent for CASIO Europe GmbH to contact me for this purpose. I would like to receive newsletters via email from CASIO Europe GmbH with information about new products, technical innovations, tips and tricks, competitions and promotions by CASIO Europe GmbH. I also give permission for CASIO Europe GmbH to process my personal data (contact details, browser-related data, brand preferences, click behaviour within the newsletter or on our websites and social media channels) for this purpose and to create a personalised user profile to better tailor the promotional approach and web content to suit my personal interests. You can withdraw your consent at any time at www.casio-europe.com/euro/newsletter/ or via the "Unsubscribe from our newsletter" link at the end of every CASIO newsletter. Doing so will not affect the legality of the processing carried out before your consent was withdrawn. You also have the right to object to the processing of your personal data for marketing purposes at any time.